Stan's new column is up! Raindrops on roses and whiskers on kittens... I have a lot of favorite things! It's a good thing, too, because the Kilchis river is closed. Bill is moping around over the loss of his fishing rights. I keep telling him to force himself to go down there and discover the other hidden treasures of the river, like I have in the past. So far, no luck. That's OK! I'm going to go! Every year I slog down there without my rod and I am amazed at what I find, even without the chance of a steelhead! 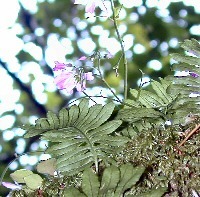 green ferns, and contrasting purple wild flowers! Smolts, collected in the shallows, and soaring eagles! It's really quite amazing! The trip to Palm Springs was... well, mostly travel! The party was a great success. I stayed overnight at my sister Teri's, the night before. We got up very early and caught the plane South to Ontario. I picked up my rental car and did I ever go into culture shock, driving from Ontario to Palm Springs on the ten! Six lanes of 80 mph traffic! Yikes! I was not prepared, and kept my hands glued to the wheel. I think that Starbucks "double shots" are a must have before hitting the LA freeways! Soon, however, I was pulling into the driveway at my motel, and safe and sound inside my air conditioned room. It felt like a huge success, after all of my surgeries, to be able to manage on my own. Saturday I drove over to the house that my sisters had rented. What a beautiful home! Everything was marble, and was centered around a beautiful pool. (That we did not know how to operate!) We never did get the pool heated! After a full day of preparation, mostly by my sisters, the party began. First, all of Dad's neighbors arrived. My brother David, who in actuality was already here, was driven to the airport so that my Dad could pick him up. He faked his arrival! He told my Dad that his friend, "Nate" was staying in Palm Springs, and wanted to go see his really neat home. So, he brought my Dad over, knocked on the door, and when no one answered, he came in. I was playing the piano alone in the expanse of the marble living room. My Dad did not recognize me!!! How hilarious! He just nodded to me and said something like, "how lovely!" Then, my family and his friends all came out from around the pool and yelled, "Happy Birthday!" I thought we'd need an ambulance standing by. He was so shocked! It wasn't until moments later, that I tapped him on the shoulder. He turned around and was he surprised! He said, "Oh! That was YOU playing the piano!" We laughed, hugged, and there were lots of weepy eyes. The next day was spent readying for travel, yet again. My niece Erin and I ventured back to the airport and didn't arrive into Portland until 10:40 PM. The trip back was eventful and stressful! We couldn't find gas for my rental car, and traffic was so heavy on the ten that we were late. However, we caught the plane just in time! On the plane to California, I had a terrible experience with a male flight attendant who refused to help me lift my carry on. He was so rude! Of all the flights that I've taken, and all of the people that have helped me since my surgeries, I have never been treated so poorly! I asked for his assistance, and explained that I couldn't lift over 10 pounds. He questioned me as to why, then, I was pulling it on rollers. He told me that I would have to "learn" to lift that much. He went on and on as if I were faking it, and just being lazy. I simply could not believe it! I finally got assistance from another passenger. Can you believe a steward would be that rude? It's embarrassing enough to have to ask for help! Sheesh! Anyhow... everything else was rushed, but well worth the trip. I slept like I've never slept last night, and I'm still a bit wobbly and tired. I've convinced myself, however, that if I can withstand all of the travel, standing, waiting, and pulling of my luggage, I can surely withstand catching a salmon! 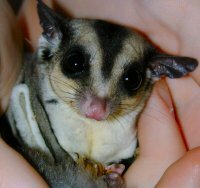 The drive home was spiked with sadness, as I picked up Phoebe, my son's sugar glider. (Click here for a picture of Phoebe!) The entire trip to Palm Springs was spent on the phone, either with the vet, or with arrangements for sugar glider travel to and from the vets in Portland. Finally, the decision was made to at least open her up to see what was wrong. She was filled with large and small growths, and the vet was assured that this problem could not be taken care of with ease. She was put to rest, yesterday morning. I picked up her fragile body in a small white box with her name on it. They had decorated the box with small stickers of roses. I guess for the price that they charged, they should do these things. It was a nice touch. It's difficult driving in California, but it's even more difficult driving home to the beach when your crying as hard as I was. Phoebe was such a sweet, sociable little pocket pet. I really didn't expect the tears to flow so freely. I think that my fatigue, plus the heartbreak that this would bring to Andrew hit me hard. Thanks to Phoebe, our lives are much richer. She brought us so much joy in her short life. I'm home. I'm ready to start over. My life seems to just keep starting over, and over, and over, lately! New beginnings start each morning that my eyes open. I don't know what it is, but Bill can't get me out fishing. The doctor said, "No fishing till Summer. We don't want you to get chilled." Well, I've broken that rule, but I seem to fall back on the excuse when it suits me. When he asked me to fish the Columbia, "But, Bill! The doc said no!" Bill argues, "I don't think the doctor knows how well you are prepared for the cold, with all of your warm clothing." We go back and fourth. Well? He did! He also said no salmon or steelhead, but yet I broke that rule, too. I use the warnings when they suit me. I throw caution to the wind though, when my rod bends over, and my line is pulling hard. Fish on makes me forget everything! I've caught at least a half dozen steelhead since my surgery. I did it by breathing slowly... and I did it in the comfort of my own back yard. That way, I can quit when I need to. For some reason, I am afraid to go anywhere else. I'm so afraid of having that exhausted feeling come over me, and not be able to get to a place where I can rest. Bill asked me to go out on the bay today, to go check for lings against the jetty. Oh! How I love lings! But no! "Bill! I can't go out on the bay! It's too choppy!" I need to start slow, I guess, but I do need to start. I don't know if it's because of aches and pains, or because I'm just plain afraid, or because I'm a touch depressed about it all. Maybe it's a combination. I feel pushed, though, by Bill's constant pleas to get me out there. I think it needs to be my idea. I urge him to call his friends and just go without me. At the same time, I feel a twinge of envy as the trailer pulls out of the driveway, and bumps up and down on the uneven gravel. With each bump, I feel more and more left out. Women! Even I feel I'm fickle, right now! I think I need to start slowly. Maybe a short trip down the Wilson? Maybe a quiet cruise for springers on the upper bay? But, what if? What if I hook up with the fish of my dreams? What if I can't let go? Maybe that's what I'm afraid of. Maybe I won't want to hand off the fish if it's too big for me. If I play it, it could hurt me. If I don't, it could make me cry! Either way, it could break my heart! I try to convince myself that just hooking it is the most fun. I try to tell myself that playing it is just plain work, and that doesn't matter to me. I have to tell myself that, because I have to do that. But, is it true? There is a justified satisfaction in doing the whole thing by myself. I don't think I'll feel the same, not bringing the fish to the net, by myself. It's the same sadness I feel not being able to do my part in the whole process of boating, anchoring, etc. I recall last year while salmon fishing. Bill and I had a double on, while backtrolling. We were both in hysterics because we both had fish on! I was in charge of the anchor, and he was in charge of the motor. We both had both hands going, and it was a zoo of laughter trying to get it all down, and both fish to a net. I'll so miss that kind of chaos! I'm feeling frustrated. How fragile am I? I have asked every doctor and no one can tell me. They all try to pass the buck. "Ask the cardiopulmonary surgeon. Ask the cardiologist. Ask the physical therapist." For crying out loud, doesn't anyone know what I'm capable of anymore? Finally, one doctor told me, "Jennie, no one knows. If anyone tries to tell you, they are lying. You could sneeze and it could rupture your aorta... or you could make it through a marathon. We just don't know." So, for now... it's a 10 pound limit for me, and that means no handling of the anchor, and the decision of whether or not to fully play a fish, all to myself. I have kids to think about, and that makes the decision pretty easy for me. They need me. You know, it kind of helps that I don't really feel good enough to go, anyhow. I tire really easily, and somehow afternoon naps last well into the late afternoon. They said four to six months before I'd feel like myself again. I'm starting to feel a bit better, and it's been almost four months. That gives me hope! I'm not quite to six. Maybe I'll feel like superwoman by six months? I'm starting physical therapy next Monday, again, and I'm convinced she will help me to regain my strength. It will also help me to have the confidence to go places, more often. I have to get out, or I could get sucked more deeply into this "staying home" phenomena that is digging it's heels in way too deeply. I gardened, yesterday. I had to force myself out of the house. That's what I need to do. Push, push, push to get my life, back! On another note, we had our first evening grosbeak yesterday, and a lone purple finch, too. Last year, the American goldfinch were here in numbers by this time. We haven't seen one this year. Where are they? I have life to look forward to, and with each passing day, I realize that everything is so much different, now. There is change after something like this that no one but people that have faced their own mortality can fully comprehend. There is an appreciation for life that is only bought by this kind of unfortunate experience. It is a gift, really, but one that comes at a very high price. I have had to give up the idea of having eye surgery to improve my vision, but I feel I have gained another kind of vision throughout my dissection experience, that cannot be "seen" with the eye. I'm full of it, this morning. Don't you think? It's pouring down rain outside, and there is a fire burning in the wood stove. You'd think I'd want to just curl up and enjoy it. But, somehow... I want to go fishing all of the sudden. I am thankful that I can attend today's fin clipping. You know that? Simply, as simple as that. Want to go? It's really fun! It's this morning at 9:00 at the Whiskey Creek Hatchery, out Memaloose way. Here is some info on the Tillamook Anglers, who put the event on each year. Click here, though, to find out about the fin clipping! I didn't sleep well last night, so I'm really groggy! I may not be able to stand up long enough to clip, but I can help, somehow! I'm going to sell some hats and decals and donate the proceeds to the event. I have to do something! Truth be told, I haven't yet recovered from my trip to Palm Springs. I feel just beat! But, it was worth every moment of it, even if I do have to somewhat start over on my recovery. When I told my cardiopulmonary surgeon about going, he said, "Now that's living!" You know, it really, really is! Every little part of what I do is living. From dragging down the stairs in the morning to grab some hot coffee, to fixing dinner, to sitting at the kitchen table, watching the spring birds. I'm living. So are you! Celebrate, man! I have been having a craving for fishing the Trask. I think I may try that tomorrow, if I sleep better, tonight. Anyhow, I'm off to the races... I mean the clipping! Hope to see you there! April 11th... here springer, springer, springer! I can hear them coming! They are out near the jetty, now, and I must go find them! Funny, the following happens every year. One day I'll wake up and open the door to let the dogs out and it smacks me in the face! It happened, just this morning! I opened the door and it came rushing in at me. I let the dogs out, and closed the door on it. I stood there, trying to figure out what had just happened. In my groggy stupor, I couldn't figure out if I wanted to let whatever it was in, or not! So I opened the door ever so cautiously, and peaked out at it. Ah! It's SPRING! Let 'er on in! It was that warm rush of rain in the trees. It was a soggy feel of wet cherry blossoms, and heavy, dense greenery. The temperature in the air was not unseasonable. However, with all of the green and lush foliage, it makes it seem warm and dense and sultry. I spent part of the afternoon yesterday planting the flower boxes that decorate my front and back porches. I could spend all day at the local nursery here, if my credit card could withstand it. I want one of these, and two of those, and of course I need three of these to match up with the boxes, and... Oops! I don't have that much money! So, then I have to cut back, and figure out if I can really grow pansies from seed, or if I have to have one of each color, no matter what. Do I want to eat, or feast on flowers? I could starve, and feel sated and full from the blossoms, but the boys? They need food! They laughed at me last year as I made them salads of nasturtiums and fuschias. But, as I opened the door to spring this morning, I realized that I had succeeded in planting my fill of flowers. I have to go get the rest of my root canal done, today. Someday I will be all done with this medical race! Seems like one thing after another! No, wait! It IS one thing after another! Tomorrow is physical therapy, and thus repeats three times a week. Hey, I guess as long as I can read medical appointments on my calendar, I am still alive! Still, I am going to pencil in a springer day or two. Nice thing about springers on the coast is that I can go for a couple hours, and not worry if I poop out. The only thing that traumatizes me is the thought of getting a huge springer on my line, and not being able to let go, for my life! I can just see it now! Me, with my rod going nuts in the holder... Me, with a wild springer shooting across the bay at light speed! Me, telling Bill, "NO WAY! THIS IS MINE! Get away!" It makes me giggle just to think of it! I have a feeling... a very distant feeling that I will not be handing off any springers! I will just breathe through it! I was talking to Lee, Marty Peterson's wife the other day, and told her that the doc had said, "No more salmon!" She was shocked. "But, Jennie, that's what you do!" Yip, that's what I do. I'm not stupid. I will hand it off if it scares me. I think, even if the doctor's don't know, that I know my limits. Yesterday, feeling bored and frustrated, I decided to take a walk. I clipped on Kilchis's leash, and headed up our steep driveway. I had not climbed it, since before my dissection. Wow! That's quite a hill! My heart raced, and beat like crazy, and it gave me a touch of the feeling of what it must be like to exert oneself on a salmon. I don't think I'm ready for that hill, yet. I better start slowly... with a salmon! So, I walked down the hill, went inside and grabbed a pair of binoculars. I had seen a dippers nest across the river, and I wanted a better look. Much better. Level land is easier for me to navigate. What a treat! I sat for quite some time, watching two dippers build their nest on a branch of the maple tree that overhangs my favorite fishing hole. I wonder how many steelies they've seen pass underneath them? They were so cute! Their songs are so amazing and melodious! Talk about "whistle while you work!" These dippers have got the right spirit! Their legs are so amazingly strong! They actually walk through water that would bowl me over! They'd pick up a twig and fly back to their neatly cupped nest. I found a reason to call me back to the river! This will be fun to watch progress on. I've got to quit rambling and get on with a shower, and getting ready for my doctor's appointment. Off I go-- Have a great week, and please, please, please, catch a springer and tell me how it feels!? It's not uncommon for me to take a fishing break this time of year. It's the reverse of the convenience of having all of the fishing happening all around me at the coast. Now, the fishing is good in Portland. Well, usually it is! It is not so good, this year. Double that with my health problems, and I'm even less likely to venture over there. I usually make a couple trips to the Columbia, and a couple to the Willamette. This year, I just haven't made any! I might this weekend, to fish the Salmon Quest. I've been invited to fish free, or at least go to the banquet. We'll see. It would be fun to even see all the gang. Instead, I've been taking slow river walks each day. Yesterday I noted progress on the dipper nest. My, it's coming along nicely, if I don't say so myself. They have built it into a completely covered ball. It looks something like a mossy football, with roof and all. I'm amazed at their architecture talents! There is a little hole for an entrance that I can see from the shore. It's fun to watch them pop in and out. I love the little dance they do. Their little knees bend as if they are doing a curtsey, after and during their performance. They are so cute and from the sounds of their song, so content! Their happiness is very catching. 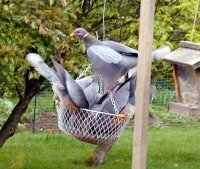 The Bandtail pigeons have made their spring debut, and if given half the chance, they can mangle up all the bird feeders, and wreak havoc on my deck, in minutes of feeding. I love to see them arrive, but man oh man, can they ever mess up a deck in a hurry! Sloppy, sloppy, sloppy! We have a couple white crowned sparrows, and a few purple finch. The spring birds are just late, this year. Well, it's early morning, and David needs a ride to school so that I can sign a permission slip that he forgot to bring home. I think I'll dress in my tennis shoes and try to make it all the way around the track at the high school. You'd think that exercise like that would make me feel good all day, but it really makes me tired! Still, I'm going to push it, and go with the thought that soon, it will make me feel good, again. It's dark and ominous and thundery looking outside. Hope it doesn't pour on me! Oh-- hey. I have been working on putting a picture together, lately. For some reason, I have mentally blocked out complete blocks of time from the night of my dissection, and afterwards. Maybe that is a good thing. Still, it bothers me. I called people that night that I have no recollection of callling. From the moment the Tillamook ER people loaded me in the ambulance here at home, to the time that I woke up from surgery, I have only flashes of memory! Next thing I remember is asking my sister, Teri, to pray for me. But, I remember doing that once. She giggles, because she tells me that I would wake up after surgery, and see her, and ask her to pray for me. She'd say, "Right now?" and I'd say, "Yes." So she'd say that she would take my hand and pray, and I'd fall asleep. Then, in five minutes, I'd wake up again and ask her to pray for me, as if it were the first time. She said I did this about 10 times! I remember once! Vaguely! Anyhow, I guess 10 prayers is better than one, and the result was good! I'm still counting on those prayers, times 10. I will also return them, times 10. I think that's a good practice. Hey, it works! I woke this morning to the howling of the wind through the crack in my window. I accidentally left it open a bit. My papers were blown all over the floor and the room was heavy with the fresh smell of spring. The rain splattered against the window, hard. As I picked up the papers, my cat stretched out and yawned. He was sprawled out in my computer chair, and knew that he would soon have to move. As I scooted him out of my chair and sat down, I sipped my coffee and remembered the totally lost feeling, I felt last night. It had vanished in my sleep, and I was left feeling bright, and shiny, and new. Last night, just as the day began to end, I made my way past the garden, through the damp field, and down to the river. A gentle rain collected on my slicker. As I approached the stream, the last of the light played on the water. As I squinted my eyes upstream, I noted small heads of whitewater, playfully popping out of the current. It reminded me of children splashing out of the water here, and there, and over there! The heads of foam surged and exploded out of the otherwise flat expanse of river. Downstream, the water traveled fast, rippled but lay flat, all at the same time. Where was it going, in such a hurry? Even if I could run that fast, I could never keep up with that current. I felt overwhelmed with life, and the speed at which it travels, and I dropped to my knees. "Oh Father, take care of me! I need you! I can't do this alone!" A million Psalms ran through my mind. I looked down. My V neck sweater exposed the start of a scar that went all the way down my chest. I had to touch it. That was my scar! The past four months and four surgeries has been my life! I had blocked out huge expanses of time, during this whole health mess, and I have spent this week calling friends to try and piece it together... to remember what happened to me. I'd call and ask, "Did I call you from "x" hospital? Was I stressed, OK, how did I handle it?" To this day, I have to match these events with my life, and remind myself that yes, this is what happened to me! Never before have I needed my heavenly Father, like I did, last night. And, never before have my prayers been answered quite so wonderfully and wholly. A warm and inviting rush of air came over me, comforting the chill of water that dripped down my neck, and under my coat. I felt like I was sitting in the lap of God, all warm and cuddled, and protected. And here I was, just sitting on the dirt of the riverbank, in the rain! Life just overwhelms me, sometimes. Little things... like doing bills, and sweeping floors, and keeping miscellaneous medical appointments all seem too hard for me to perform. I had read predictions of a storm for the coast, but I had no idea that it was going to be my storm. The river was growing as I sat beside it. The raindrops fell, collected, and inch by inch, crept up the sandy slope nearer and nearer to where I sat, huddled in the rain. It's momentum grew, and the current seemed to carry away my tension...down the straight, around the bend, until I squinted my eyes against the gathering darkness, and could not find it, at all. My breath became longer, smoother, deeper. Comforted that God had answered my prayers and that my worries and stress were long carried away by the current, I rose, to find my way back to the house. It was getting nearly dark by then, and I stumbled across the field. I kicked my boots off in the mud room, and felt the weight of a long day leave me. Feeling much lighter, I padded in my stocking feet across the wooden floors, and was able to easily climb the stairs to my bed. Fresh, clean linens greeted me, and a light but warm down blanket surrounded me. Clean and fresh and warm in my cocoon, I listened to the river's melodious lullaby, and slumbered off, into a peaceful, long, spring's nap. Isn't it wonderful how every day, you get to start all over, again? Oh... I didn't sleep well... It's going to be a tough day! I have to complete a "root canal visit in Portland number three", today, with a new doctor. He seems very nice and capable of handling the procedure with confidence and ease. First, a check of my INR at my local doc, and then the journey to his office for the procedure. After this, we top it off with a visit for a crown! How I hope this is the end of it! After that, I have April 29th to "look forward to." Hands down, I'm worried about that one, and the tension is mounting. That is where my cardiologists do a full CT of my chest and abdomen to check on the dissection for the first time, since the initial damage. If it has changed or grown, then I may have to go back into surgery. I am praying that is not the case. I have decided to put off eye surgery for quite some time. I feel I have had my fill for a bit! When it was finally time to actually admit that my Mother was so ill with cancer that her days were numbered, I was in shock. It's interesting. I can relate to some of the process better, now. My sister states that she had told her that she wanted to go out, "Looking svelte!" She lost tons of weight, so therefore looked good in clothes like never before... until that darn cancer swelled up her abdomen and ruined it all. I remember how good new clothes made me feel, while recovering. I can relate! I was much younger when she was ill, and it was the first time in which I would have to deal with death, closely. My life had been a fairy tale of fun and adventure. The whole experience was a difficult whirlwind. It was hard for me to admit, and thus, my reactions sometimes were inappropriate and awkward. I spent long hours laying on her bed next to her, reading to her, cards and letters that had been sent in by years of piano students who had loved her. It was interesting to read the people's reaction who had loved my Mother. They knew she was leaving them. Some led on to that knowledge, others didn't touch the subject, and went on about life, times, and the weather. My Mother, weaving in and out of consciousness, would acknowledge some, and sleep through others. "That is lovely, isn't it?" Sometimes she'd comment. I remember her holding up her long, thin arm, and saying, "Look, Jennie, my arm looks like a branch of a big, gnarly oak tree." Morphine raced through her veins, skewing her reality and her emotions. One night, thinking myself very worldly, open and caring, I mentioned to her my worry over what would happen to the house. Anyhow, I told my Mother most honestly that I loved this house, and asked her of her plans to make certain that it was kept the way she wanted it. I thought I was being honest, and caring, and that she would appreciate my candor. It wasn't until later, that my sister mentioned to me how very much that candid conversation had hurt my Mother. I live with that deep regret, today, and it deeply saddens me. I guess, no matter how close you are to death, no matter how certain, discussing your mortality is a very difficult thing to do, with anyone... no matter how close. This did not become totally clear to me, until my aortic dissection, in December of 2004. Since then, several people have come up to me, (I'm sure in love and confidence-- just like I had), asking what I have done, "should the worst happen" to prepare ifish for a healthy future for them. Oh man! Each time, a lump rises in my throat, and this feeling of privacy violation and reality hits me that invades my very sense of personal being. I know for a fact that they do this out of love for ifish, and pride for what I have built. However, it just seems way too personal, yet, to share this with anyone. A sense of responsibility overwhelms me. Heck, I'm having trouble at this point just keeping up with life! I'm not so very certain that my future is so soon, doomed! It feels that this question and concern forecasts that doom, and it hits me with a weight too heavy for me to currently carry. I'm too busy living and struggling to get well! My doctor states that I should lift no more than 10 pounds, and this question weighs much more than that! Last night in my darkest hour before rest, I was again asked this question, and I went to my bed, feeling heavy, depressed, and deeply burdened. I have made up my mind to finish my estate planning, and my will writing. This will keep me from being very active on ifish for a while. I feel overwhelmed. If it's not 36 doctor appointments filling my calendar, now it will be 36 attorney appointments, and long papers needing to be penciled in. Huge decisions to be made, and moneys to be dealt out. This doesn't make my near future feel rosy or hopeful, but you know, they are right. It is important. I have decided to try my darndest to be immune to the same feelings that my Mother felt, when I asked her the same questions. I do want my boys to have everything in order. I do want ifish to continue to bring enjoyment to fishers around the area, and once I am through with all these immediate doctor appointments, and now hours of legal advice, I will be free to live my life without the weight of being uncertain about things. Until then, dear friends, know that I do appreciate your concern and your candor in caring about this web site that I've built. But, please understand that there is a sensitive spot there, and that it can easily be wounded by the slightest touch. When I first came out of surgery and became strong enough to stand, I longed for the feel of hugs from my friends, yet at the same time I was very fragile. Hugs had to come ever so gently. I have to think of these personal questions the same way. I know they come in the form of a hug, yet please... hug me gently, and hold me up, while you do so. I'm working on getting better, and stronger with all of my "heart". I'm working on ironing out all of the details, but it's a long, arduous, and sometimes sensitive process. I'm doing the best and the most that I can, so that should the worst happen, "the best" will be the outcome for everyone. ...and please, don't recall that you have asked this and think I am thinking of you, only. This question has been asked me several times, now. I think it's normal to be curious, and I do not hold any ill feelings to any one person. Ifish belongs to all of us. It began, as belonging to me. But, there comes a point where it belongs to each one of us, and you have every right to feel ownership, and concern. I'm honored to feel that I have had a place in creating something that you feel so deeply about. That ol' rush of spring air hit me again as I let the dogs out, this morning. I love that! I'm going to attempt. (Try, with all my might!) to go springer fishing, today. I know it's early, but that's just as well, since I'm really not supposed to be doing this, anyway. Chances of actually catching a fish, are low. I can't play a springer, or bring one in, but I can sure as heck try to hold the rod and feel a bite. Who cares if I can't do the dirty work of playing it? It is nasty, awful hard work to hold the rod while the fish zips and races from one side of the bay to the other. 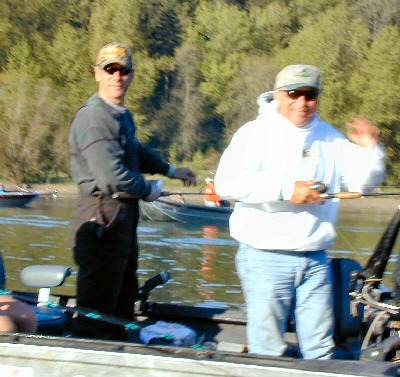 The Spring chinook's energy curses through my body, jerking and pulling the line out at light speed. Ohhhh! That's TERRIBLE! O.K., so that's something I'm going to miss. But, I can still feel the bite. I told Bill, "Remember the last two years? Twice, a fish actually pulled me from my seat, when it hit." Now that I weigh less, it might pull me in! This half worries me, and half has me giggling in anticipation. This won't kill me... right? Somehow, the chance of it being dangerous for me almost increases my will to try it. I wish that I didn't own that hint of dare devil in me. It could prove to be dangerous for me! Fishing is a part of me. I have no choice but to go. I'll let you know how it goes. On April 22nd, 2005, we struck gold! Whoo hooo! 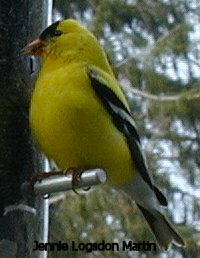 I spotted our first American Goldfinch on the feeders! It wasn't alot of gold-- only one, but still! What a rush! I love the fact that our birds are seasonal. Every time a new species shows up, it is recorded in our little black log book, and we know approximately at which time to look for it the next year. It makes it like a holiday-- Christmas, or something! Now we can be relatively certain that the rest are on their way! I can't wait until my feeders are covered in gold! I got to thinking, yesterday... sometimes in life, it's what you don't have that you are thankful for. I am thankful for so much that I don't have! I don't have a wheelchair, anymore! I can remember so thoroughly how frustrating that was. I am able to walk to the river now. Oh, those frustrating days of watching the rest of my family take my dog for a walk. That really hurt! I can do that, myself, now. I may get tired, but I can do it! Whoo hooo! I recall days when I couldn't make it up the back stairs from the car. Do you know how much it hurts to crawl on your knees, up wooden stairs? Ouch! That is so uncomfortable! I can walk, now! As of late, my therapy has included shopping on Ebay for small trinkets that remind me of my friends. I then pack them up and send them, with a thoughtful note. They may be only cost me a couple dollars, but it's worth the world to me to thank them for their friendship. I am so thankful that I wasn't alone during my illness. Ifish, and the people that made it up, made me feel so loved! I get to thinking... how do people do it that are alone? It really makes me want to do that volunteer thing that I was talking about earlier. To be there for people that need a friend, during their illness or during a hospital stay. You know, I spent part of the day yesterday, longing for sunny beaches, and exotic getaways. I browsed internet sites displaying pictures of St. Barths in the Caribbean I spoke long with my sister about her travels to Hawaii... and dreamed of nights in Cabo. Oh! How those travels sound wonderful to me, right now! I have never been to Hawaii, yet my son David gets to travel there soon, with his school! No fair! I want to go, too! Long days, with nothing to do but lounge. Oh! That sounds wonderful! All of my travels in the last eight years have been medical, or work related. They are always packed with too much to do! Ten days on a sunny warm beach...now that sounds awesome! When I looked at the price tags, though, I decided that Tillamook is a darn nice place to be! The sun was shining, yesterday. Resigned to staying home, I went upstairs and put on my swimsuit and went out to enjoy my back deck. Laying there, I dreamt I was on a sandy beach, and quickly fell asleep. I woke up, much too warm, and walked to the river, and dipped my toes in. You know, it is pretty darn nice, here! It is so stormy and black outside, right now. The weather forecast is calling for thunderstorms, and I can believe it! The sky is dark and heavy. Winds puff up out of nowhere and slam against the side of the house. Heavenly Father, thank you for all that I don't have. Thank you for teaching me to have joy in the smallest of gifts, and to realize how very lucky I am, in the face of other possibilities. Thank you for sharing with me the wonder of your little Goldfinch. Thank you for the joy that you have taught me to feel in things that come packaged as small as a brightly colored bird, or in giving a gift as small as a trinket, purchased on Ebay. Teach me more, Father. Share with me the infinite wonder of your world, and accept me and teach me when my expectations grow much too large. Humble me, when my dreams stretch further than my budget! Thank you for the amazing beauty of the river, and the surrounding forests that greet me, each morning. But most of all, God, thank you that I am still here, with my family. The river is still closed for fishing, forcing me to take my nightly ventures one step deeper, uncovering another layer of magic, bankside. As of late, my binoculars accompany me on my discovery tours. They help me to truly notice things that I had never thought about. I had "seen" them, but never taken the time to think about "what" I'm seeing! For instance, start by taking a look at something that you think you have seen before. Look at the white arrow that's on the side of every Fed Ex truck. Almost everybody's seen a Federal Express truck, but have you seen the arrow? Look, next time you see a truck! Look for the arrow in the logo! Can you find it? So, with binoculars in hand, I take a seat on the nearest rock and stare. Sometimes I wait for something to move. Sometimes I stare at nothing at all, but the greenery on the opposite side of the river. It's kind of tough with my current vision, but sometimes I think I can see better than anyone else, despite my vision... and maybe because of my altered vision! The triple images in my left eye force me to really concentrate. If I stare long enough, all images meld together on their own. I sit for a very long time. Sometimes I concentrate on my breathing. It's a good time to meditate, and find peace along with any hidden treasures I might discover, along the lush, green river bank. Look at the tiny purple flowers! As I breathed in and out, my arms begin to ache from holding up the binoculars. But wait! What is that? A hole in the moss, an indentation... right there! What is it? As I swept my line of sight downwards, I noticed white splotches on the rocks. Bird droppings! My steady slow breathing stopped in an instant as I held my breath. Arms shaking with fatigue, searching upwards, once again. It's a nest! A nest that I never would have seen! Not even had I been walking there! I'd probably have stumbled right over it! I'd not even noticed that 10 yards upstream, a dipper sat on a rock, waiting for me to relocate, so he/she could go back to the nest. There the dipper stood, knee deep in water, protectively monitoring his home. I adore how dippers "dip" their knees, as if in a curtsey. Dipppp.... "If you don't mind, ma'am." Dippppp... "I'd like to return to my home." Sure enough, it had twigs in its beak! The dipper cocked his head with impatience. I giggled and got up to move to the next station of meditation and discovery. I noted the rock in which to return this evening, to catch up on the progress of the nest. As I moved, the dipper flew to its home. At first site, you'd just think the dippers were randomly flying along the bank, feeding, but they have serious business and building going on! With cane in one hand, and binoculars in the other, I made my way 20 yards downstream. I stopped and began my slow, steady breathing, again. I rested on another rock, propping my elbows on my knees, binoculars up and ready, and gazed over to the opposite shore. It took some time, but I finally realized I was staring at an otter slide. It had to be! And not only that, but there were numerous sticks and baby trees, eaten to stumps by a beaver! I sat for quite some time, and never did see the animals, but the experience left me with a quest to return. I will see these animals, someday, if I return. I know I will! And what a treat that will be! You know, it's kind of like fishing. That "quest is best" kind of feeling, where you know they are out there, and you just need to be there at the right time to catch them! Back to the Fed Ex logo... If you haven't found the arrow yet, it's in between the "E" and the "X". See it, now? Amazing, huh? I have "seen" that logo so many times, and never discovered it. So, take an evening walk sometime. Even if you live in the city, there are trees full of life, all around you. I promise, if you stare long enough, you'll see evidence of things you have not noticed before. Not only that, but you'll discover a calm and peace that comes over you, just by sitting, and breathing deeply. Concentrate only on what you see, and block all other worries. The sites you'll discover are amazing. The reward is awesome. The peace that follows is refreshing. Take a moment out of your life, to take it all in. There is more out there than you had ever dreamed of! I can't wait until tonight! I got another three month pass on life! That feels weird, but it's the way I have to look at it. This way of living was introduced to me by a girlfriend who I met through the Marfan e mail list. She had a dissection nearly one year to the date, before mine. She is now up to living in six month passes from the doctors. I can't wait till I'm there! Yesterday was a long, grueling day, preceded by a week of worry about it. That was preceded by a month of expectation. I'm exhausted, now! I really am! I fell asleep when I got home at 5:00 PM, and didn't wake up till 6 this morning! When they first called to set up the appointment a month ago, they said, "Please show up at 8:30 AM. Please do not eat or drink anything after midnight the night before, in preparation of your cat scan." The last time I had a cat scan at OHSU, they told me the same thing. Then, when I arrived, they had me drink an entire huge glass of water, so I wasn't dehydrated. I was confused. Why not eat or drink if they are going to force feed me water? I said, "What? Why no eating or drinking?" She didn't know, so she attempted to transfer me to the cat scan office. They weren't available. The doctor's office then called the day before my appointment as a reminder. "No eating or drinking after midnight." Huh? They again transferred me to the cat scan office, to answer my questions. They insisted it was because I would drink liquid contrast (barium) for a complete chest/abdomen/pelvis CT. I said, "No! I don't do that. Please check the protocol." They told me they didn't have the protocol, in a very impatient tone, and insisted that they were correct. Finally she told me to call back in the evening when the protocol came in. I did so. Sigh. Again, the man on the other end of the voice was very impatient, and didn't want to argue with me. He insisted he was right. So, I arrived at 8:30, having gotten up before 5 for the two hour drive to the hospital. I arrived at the check in and she told me I would be drinking barium. "Please check the protocol. I don't think I am going to be drinking that." She explained my test would take 45 minutes, and that indeed, I was drinking barium. She called a nurse to the waiting area, so I could get a proper explanation. The nurse arrived and looked at my protocol. "You will not be drinking barium. You don't need to be here, yet. Your appointment is at 9:30. Please come back then. We will do an IV, and your test will take 10 minutes. ARGH! Please, people! Make certain they know what they are doing for you! This is not harmful, but an excellent example of the doctor's not knowing what the other doctor is doing. The reason they had me drink all that water last time, was because they realized their error, and knew I should not be dehydrated like they had ordered. Thus, without telling me, they had me drink all that water to make up for their mistake. Sheesh! I asked how I could escape this problem in the future, and she told me to just listen and say, "Uh huh... alright..." and then don't follow those instructions! What? Why can't I just fix the misunderstanding? This isn't right! Even the cardiologist's office insisted I was to take barium. I had gotten up early, shown up early, and all for naught. The frustrating part? They weren't willing to help me fix the problem for the future. Finally, I took the test. It was fine. It was on time, and they did everything they could to keep me comfortable and pain free. The IV fluid is very thick like syrup, and they have to put it in really fast. It's painful, but not too bad. Gee. This is going to be a long story. I'm going to run out of room! So, after my test, I was to go to Dr. Song's office to hear the results. They were measuring my aorta. I am dissected all the way down to my pelvis. This means that the three layers of the aorta are split, Like layers of pressboard that have gotten wet and warped, they are separated, and blood is seeping through them. As long as this does not grow too much, they are going to treat it medically by keeping my blood pressure and my heart beat down. This is treated with lisinopril and beta blockers. You can read more about dissections, here. When I had my emergency in December, those layers had burst, or ruptured in the top arch of my aorta. My appointment with Dr. Song was to be at 10:00 AM. Dr. Song saved my life in December. How does one feel about having their life saved? How do you thank someone for that? I can't, but I try. He is the most amazing man. You'd think someone who works on hearts would be cold and scientific. He is not. He is warm, caring, and personable. I waited in his office. They took me right in to a room, but it was there that I waited. His partner had been called to surgery, so he was doing double duty. I waited for two hours! Those were the longest two hours of my life! I don't know why they call us patients. I think we should be called "impatients." Waiting to hear if my aorta had grown, whether I'd need more surgery... whether I was alright... waiting, waiting, waiting! I spoke to the assistant about the problem with the cat scan orders. Finally she understood the problem. She said I am their only patient who does not require barium, so she would work on a fix so it would not happen again. She understood my frustration, and I appreciate that! Finally, he came in. Just like a doctor would, he came in with the good news, first. "Jennie, your scan showed that your abdominal aorta is unchanged, and looking good." I could tell this was being said before the blow of bad news. "But?" I asked... Time was stretching. I knew there was bad news. "But, your proximal arch has grown, considerably." Ick. I didn't want to hear that. The room grew silent. I really didn't want to hear this. Could I leave the room? My world tumbled, and everything was different, but he just kept talking like it was all the same. Wait a minute! Wait! Slow down! Don't you realize how this affects me? What could I do? He kept talking and I couldn't hear him. I was stuck way back on the word "considerably." Finally, I began to catch up. We talked about the surgery that would be needed to repair this. He mentioned it would be more painful then the one that I had previously endured. That they go through the back, dividing several muscles. That the surgery was at least as long as my other. Over 10 hours! The risks, the fact that he didn't know if I was up to it, yet. "But what?" I was on the edge of my seat. "But, this is comparing your cat scan to the cat scan in December. I don't have handy the cat scan you had at Stanford. This could be the same as the one you had in January at Stanford. I don't want you to hang your hat on this, though." "O.K..-- so, when will we find out?" He called his assistant to go look for it. He told me that he would call me later this afternoon with the results. More waiting. More long, frustrating waiting! Bill and I left the office. I was in a state of suspension. I was afraid to hope for the best, but at the same time, I hoped. Thoughts of surgery raced through my mind. I tried to chase away the cloud of doom by going to Costco. Part of me felt like buying one of anything I wanted. After all, I might not have to be around to pay for it! I did splurge a bit. I bought some wonderful Egyptian cotton sheets for my bed, and some cozy soft socks called "therapy socks." Lately, I've been called by articles of comfort. Things that make my body feel good follow me home from stores. I couldn't wait to put on those socks! On my drive from Costco to the deadline of cell phone service, before going over the mountains, my cell phone was silent. When I broke through to cell service, my cell phone beeped with a message. It was only my sister, wondering how I was. But then, it rang! "Hello?" It was Dr. Song! "Jennie, I have some good news for you! Your cat scan exactly matches the measurement of your proximal arch in January! You couldn't ask for better news!" "Whoo hoooo!" Did I have a doctor, or a 40 pound salmon on the end of the line?!? I hung up and called my Dad, my sister, and many of my friends! Whoooo hoooooo! I played my words like a slinging springer walking on water! Only problem is.... Now I have to pay my Costco bill. I have a free and clean pass for three months. Life is good, even with the Costco bill! Those socks feel darn good on my feet! Next time they tell me I have to drink barium, and show up an hour early to do so, I'm just going to say, "Uh huh..." and do as I please. I know better! Now I'm off to the river. There are some active redds out there, and it's a blast to watch. They don't even have the "do not disturb" sign out! I almost feel kind of like an invader of privacy, but it's so fun to watch! Nasty fishes... in the wide open! Don't you think they should be a little more private about these things?